Rhonda Lieberman, Fontainebleau Hotel, Miami, 1992. Photo: Dana Byerly. The Rhonda Lieberman Reader, edited by Sarah Lehrer-Graiwer. Los Angeles: Pep Talk Press, 2018. 536 pages. NOT JUST BECAUSE IBarnard shiksa from the boonieswas conditioned to envy my more socially savvy Jewish American counterparts for their sunglasses (from Selima), their scarves (not Hermès, actually) knotted the way their mothers taught them, and other birthright privileges awarded young ladies of a certain socioeconomic-religious-cultural demographic, who I imagine learned about Freud from their fathers (this is just a fantasy! ), am I fascinated by Rhonda Lieberman. 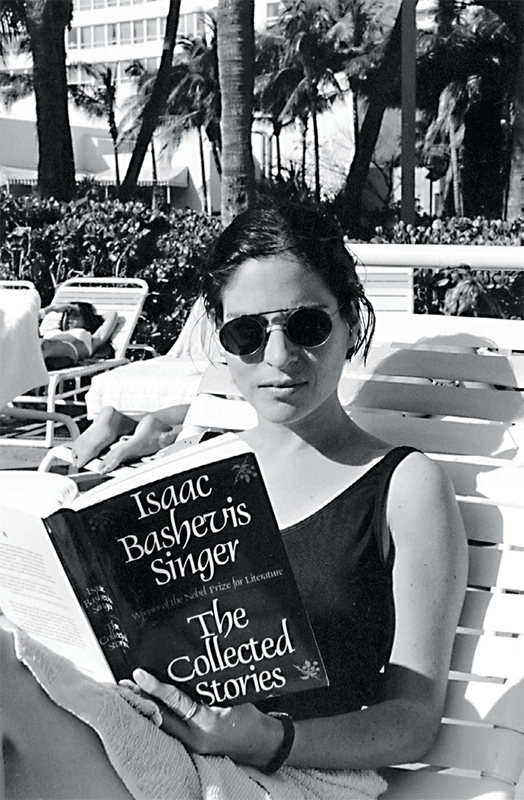 Bred in a NYC suburb, Brandeis ’82, writer extraordinaire, she’s the patron saint of Jewish girls with their typewriters. She embodies the particular kind of East Coast sophistication I ideated and craved, a wry dinner-party companion known for asides about her complicated relationships with intellectuals (“My friend P. who was my partner then but he was my semiotics TA at Harvard when I spent one year there my first year at grad school, he’s a Lacanian topologist now. . . .”) and her deadpan humor (“My chief perspectives on optimism were: 1) daily horoscopes and tarot readings; 2) Friedrich Nietzsche; 3) listening to [others on] Prozac”). The Rhonda Lieberman Reader, edited by Sarah Lehrer-Graiwer and published this month by Pep Talk Press, beautifully brings together nearly three decades of Lieberman’s work as a superb critic (who hates moralizers), columnist, and dry party-reporter (a delightfully unusual freelance job for an academic) for Artforum, as well as essays and talks for the Village Voice and Bookforum and the like. Her oeuvre is a smorgasbord of goodies. This is the critic who crowned Karen Kilimnik a “mouse diva.” Who convinced us that Jeff Koons emerged from “that same petri dish as those helmet-haired guys on late-night infomercials who tell you you can fully self-actualize yourself financially and spiritually by buying their tapes.” She wholly exercises her outsider status and differenceshe’s a student of Derrida and Foucaultwhether she’s in a hair salon with her mother (“who has the soul of a drag queen”) or at the Walmart heiress’s image-laundering museum (“Marie Antoinette playing dairy maid at her vanity farm in Versailles”). She discusses the theory wars and teaching (and the horror of adjuncting), and includes the syllabi from her years schooling kids in critical issues in Chicago and at Yale. For a class called Paranoid Thought, she required each student to “stalk” another class member and present their findingsand to read Dostoyevsky, and Vernon Howard’s Freedom from Harmful Voices (1981). The Reader also teases out her softer side. (She’s pictured many times over with her cats.) We learn, for instance, that she once loved a married man with a micropenis. It’s possible, reading this text, to imagine that Lieberman invented the internet—and I really wish she had! Greenberg saw his Jewishness as alienating him from mainstream American cultureand embraced this alienation as a hotline to (real, ‘High’, cosmopolitan) ArtMY mother’s milk was pasteurized with Pop: (I started each day with a Danish-Go-Round, at nite we’d have the Coca Cola Chicken . . . ). Being alienated from Pop was not the first step toward cosmopolitan graceas it was for Greenberg’s generationbut became for me, increasingly, an alienation from myself, from my authentic suburban experience . . . My personal Joseph Campbellesque journey involved integrating my Shadow side of kitschgoing to the belly of the tacky beast that threatened meand embracing its moist, hairy, pinkie-ringed pawas my friend and healerrather than my persecutory bad object. The Reader speaks to Lieberman’s “red-phone moment”not the aesthetic impurities of lowbrow culture (à la a very dead Greenberg), but capitalism and its dotty offspring, the try-hard consumerexemplified by Thorstein Veblen’s pecuniary emulation, i.e., the Jewish American Princess who buys a Coach purse at twelve only to learn about Prada a year later, flipping through magazines while waiting for her mother at the hair salon. Ugh. From her 1994 “Revenge of the Mouse Diva” essay: “As a petite Jewess who likes glamorous things . . .” She’s our critic moonlighting as a verbose shopaholic! Only Lieberman can describe a “woggle-shaped lagoon” of a pool. (A woggle is a ring you use to fasten an Hermès scarf . . . or it’s from the Girl Scoutsstill within her purview.) Rhonda braves the Chanel flagship: “I was commanded to expel myself as a symbolic turd: a constitutionally flawed, heterogeneous element that had to be pressed out of my reality because it couldn’t exist with all that senseless plentitude.” The Wandering Jew once again . 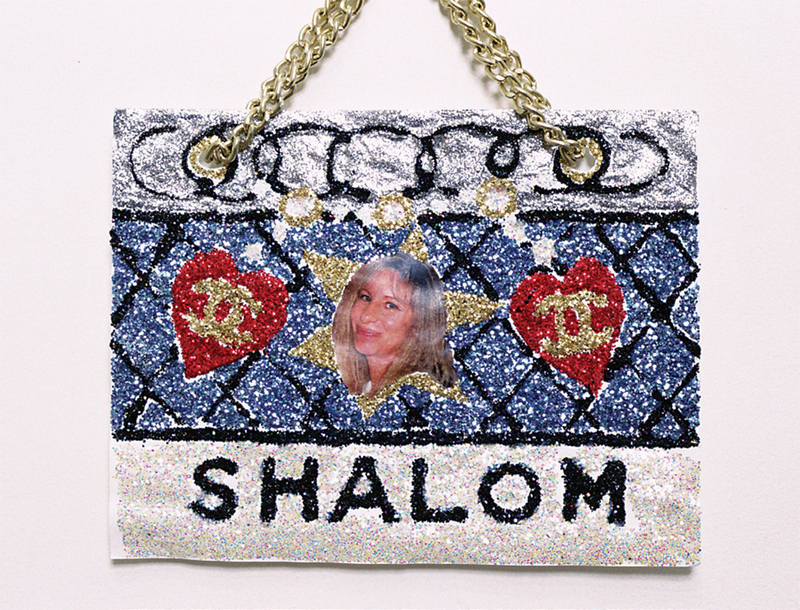 . .
Rhonda Lieberman, Shalom (Barbra), 1992, glitter, mixed media, 9 × 11". From the series “Purse Pictures,” 1992. Reviewing a book by Lieberman weirdly feels like reviewing herthere’s so much of her she’s working through: the graduate years at Yale (“like passing a stone”); her subconscious (“Lately I’ve been having a lot of celebrity dreams. While they’re not prophetic or objectively true [e.g., we know that Madonna is a Leo] . . . ”); her therapist (“An ex-friend once mentioned that her therapist wore a certain kind of then-coveted Prada shoe. I could never go to anyone like that”); her love life (“The Jewish Don Juan entered my life just about when the U.S. invaded Iraq, with equally auspicious results. Not to over-dramatize”); her arti.e., her id!which takes the form of fake fetish packaging of mock-Chanel products, from scented cat litter (adorned with pearl handles) and Chanel Beauty Cat Food (“gourmet flavor”) to Chanel-brand oven mitts. 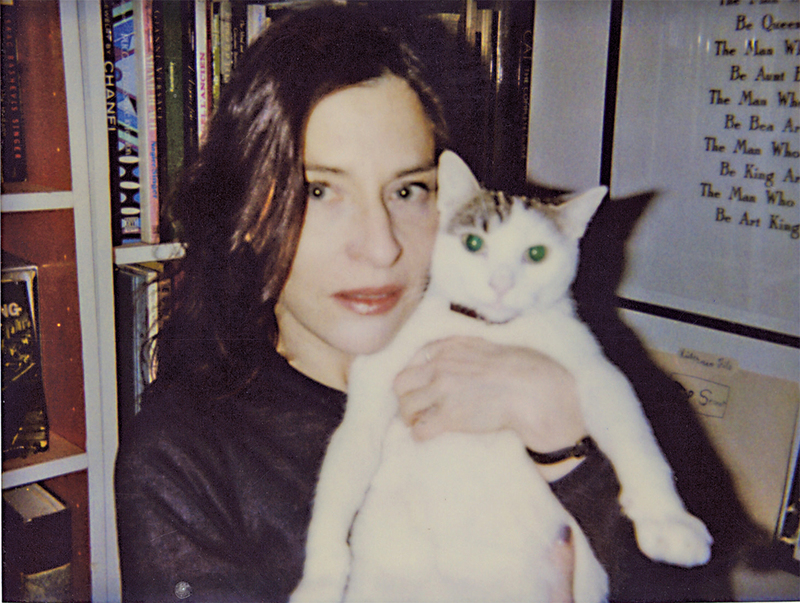 Rhonda Lieberman with Yingy, New York, ca. 2003. Lieberman carved out her own lane by returning again and again to her own trauma, the source of her “glamour wounds”to recall the title of her column in Artforum, which ran from 1992 to 1995. She embraced her shopaholic suburban roots as a hotline to pathos, alienation, and embarrassment. (As a millennial from Montana, with hoarders on both sides of my family, I was pleased to see my trauma processed as high discourse.) She argues to the effect that hotlines themselves are a prerogative of Jewishness; the outsider has the best vantage. Acting the outsider critic in the pages of Artforum may be a cute Gen-X slacker tick, but that’s where she gets her edge: Her people are the ultimate translators of the WASP experience. It’s Ralph Lauren and Calvin Klein who trigger images of blonds with calves, popped collars, and lacrosse sticks; never far from Lieberman’s mind is the fact that Jews had only just gotten into country clubs, and that they invented Barbie. “No one can imagine and merchandise the fantasy scene of WASP plenitude better than a Jew.” And no one can parse it better, as Lieberman proves. She takes Sylvère Lotringer’s idea that French theory is an American invention to its logical conclusionreading Derrida in the mall. It’s only right. “Art collecting is perhaps the most esteemed form of shopping in our culture today,” she says more than once. Kaitlin Phillips is a writer based in New York.